The annual CEDIA Awards present a fine opportunity to drool over stunning home cinema custom installs from the UK, Europe and beyond – and this year it’s no different. Projects ranging from smallscale media rooms to cavernous cinemas and smart home installations were crowned category winners at the Awards event last night, with a number of UK outfits grabbing trophies. 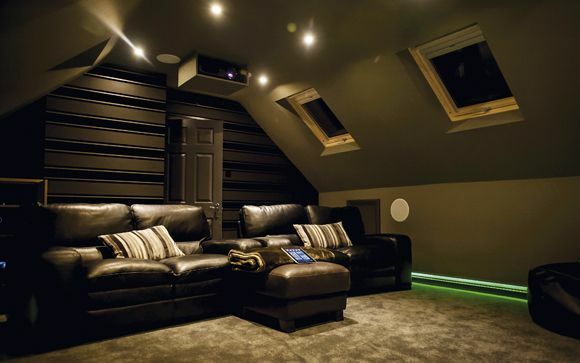 This well-dressed cinema room, converted from a basement space by UK installer The Pyramid Group, had to meet the demands of its film fanatic owners, husband and wife Bruce and Hilary. They wanted super-sized visuals and immersive audio, but had specific hardware requirements in mind. One of our favourite features in HCC is where you, our fantastic readers, get involved and share the secrets of your cinema setups, be they big or small, professional jobs or DIY labours of love. Attic conversions, basement Blu-ray dens, theatres in garden sheds or traditional living-room systems – we love to feature 'em. Not everyone has the space, or the desire, for a dedicated home cinema room where watching movies takes precedent over everything else. In this case a multi-purpose 'media room' is in order, where everyday living and high-performance AV entertainment live side by side. While for some a living room can easily double up as a home cinema, others crave a private space where they can get away from it all and settle into the serious business of watching movies. And, in this case, blasting aliens, thrashing cars and pretending to be Lionel Messi. A finalist in this year's CEDIA Awards in the home cinema £40,000-£100,000 category, this below-stairs theatre saw custom installer Finite Solutions given a somewhat unusual brief. The owners had recently moved into the house, and one reason for choosing it was that it came with its own cinema room. Yet, while happy with the performance, researching the world of personal AV playrooms led them to realise they could make it even better, and have it re-styled to their own tastes.